I became aware of this book, which was published in 2014, thanks to a video clip from Ohio Public Broadcasting that was shared on a Facebook Tiki group (I’ll post the video below). As longtime PopCult readers may remember, I am a Tiki aficianado, and have begun incorporating visits to Tiki bars and restaurants into my travel plans. 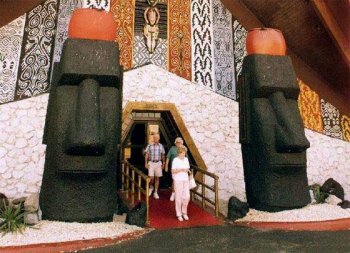 It was pretty wild to discover that one of the greatest Tiki establishments ever was in nearby Columbus, but that it had been demolished nineteen years ago. 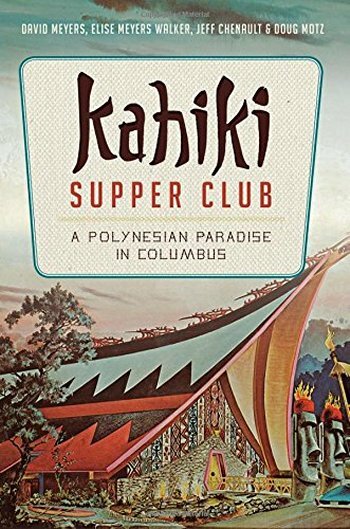 This book tells the story of the famed Kahiki Supper Club. The Ohio-based father-daughter team of Meyers and Meyers Walker were looking for a subject for their next book of local history when both Chenault and Motz urged them to tackle the Kahiki. They opted to include them as co-authors, and the result is a lovely work of history as entertainment. The authors create a narrative that moves smoothly from third-person presentation to an oral history given by the employees, customers and family members of the owners. This is a fascinating story, told very well and it’s a hard book to put down. This is the type of book that makes history so entertaining as a subject. In addition to telling the story of the Kahiki, the book also presents a few recipes for meals and drinks, and follows the story beyond the closing of the restaurant, to the dispersal of some of the artifacts and architecture of the five-story-high building shaped like a giant outrigger. The book is a must-read for any fan of Tiki culture, or anybody who was ever lucky enough to experience the Kahiki Supper Club before it was demolished to make way for a Walgreens.